Here are some snazzy birthday facts about 20th of August 1987 that no one tells you about. Don’t wait a minute longer and jump in using the content links below. Average read time of 10 minutes. Enjoy! What day was my birthday Aug 20, 1987? August 20, 1987 was a Thursday and it was the 232nd day of the year 1987. It was the 34th Thursday of that year. The next time you can reuse your old 1987 calendar will be in 2026. Both calendars will be exactly the same! This is assuming you are not interested in the dates for Easter and other irregular holidays that are based on a lunisolar calendar. What day is August 20 this year? There are 122 days left before your next birthday. You will be 32 years old when that day comes. There have been 11,566 days from the day you were born up to today. If you’ve been sleeping 8 hours daily since birth, then you have slept a total of 3,855 days or 10.56 years. You spent 33% of your life sleeping. Since night and day always follow each other, there were precisely 392 full moons after you were born up to this day. How many of them did you see? The next full moon that you can see will be on May 18 at 21:13:00 GMT – Saturday. Fun stat: Your first one billion seconds (1,000,000,000) will happen sometime on April 28, 2019. If a dog named Mitchy - a Greyhound breed, was born on the same date as you then it will be 182 dog years old today. A dog’s first human year is equal to 15 dog years. Dogs age differently depending on breed and size. When you reach the age of 6 Mitchy will be 45 dog years old. From that point forward a large-sized dog like Mitchy will age 5-6 dog years for every human year. View the complete list of August 20 celebrity birthdays. Who are the famous August 20 birthdays? Here’s a short list of famous people in history who were born on Aug 20. View the complete list of August 20 famous birthdays. What happened on my birthday – Aug 20th? Charles Darwin first publishes his theory of evolution through natural selection in The Journal of the Proceedings of the Linnean Society of London, alongside Alfred Russel Wallace’s same theory. World War II: British Prime Minister Winston Churchill makes the fourth of his famous wartime speeches, containing the line “Never was so much owed by so many to so few”. In Morocco, a force of Berbers from the Atlas Mountains region of Algeria raid two rural settlements and kill 77 French nationals. Keene, NH Episcopal seminarian Jonathan Daniels, 26, is martyred; murdered by shotgun at point-blank range in Hayneville, Alabama, by an unpaid sheriff’s deputy, sacrificing his life for young black activist Ruby Sales whom he pushed out of the way of the blast. In Edmond, Oklahoma, U.S. Postal employee Patrick Sherrill guns down 14 of his co-workers and then commits suicide. Iran–Iraq War: A ceasefire is agreed after almost eight years of war. The pleasure boat Marchioness sinks on the River Thames following a collision. Fifty-one people are killed. View the complete list of August 20 historical events. What does my birthday August 20, 1987 mean? 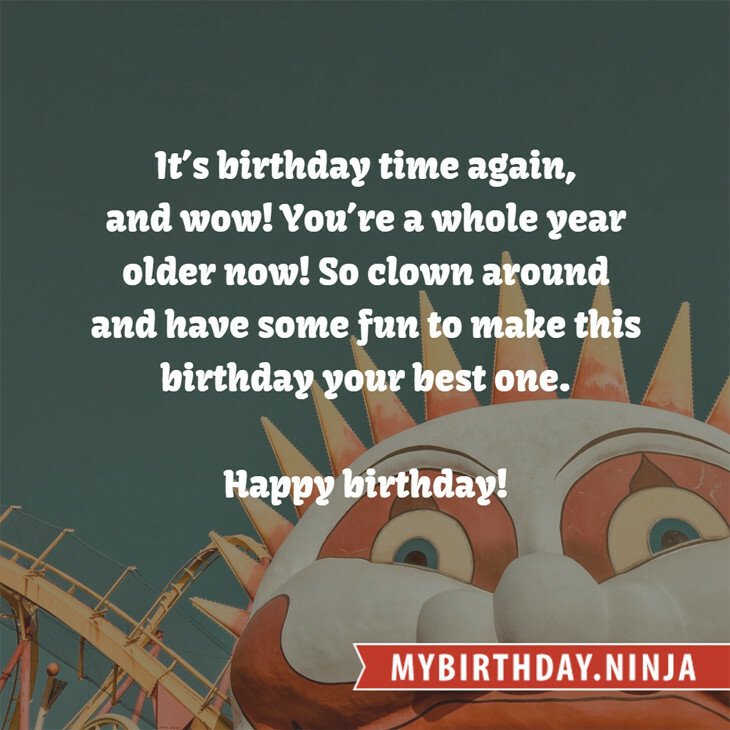 Your birthday numbers 8, 20, and 1987 reveal that your Life Path number is 8. It represents experience, authority and endeavour. You are gifted with natural leadership and the capacity to accumulate great wealth. The following celebrities also have the same life path number: Luciana Abreu, Ryan McCombs, Paul Mercurio, Sonny Tufts, Jyothika, György Bárdy, Patti Smith, Meral Okay, Tina Hobley, Pierre Clémenti. 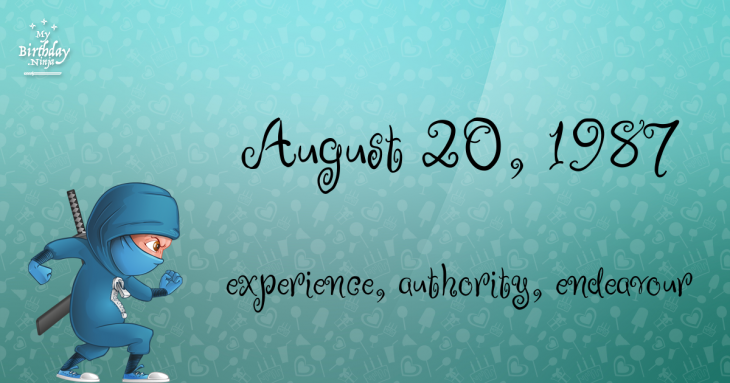 What is the birthday horoscope for Aug 20, 1987? The Western zodiac or sun sign of a person born on August 20 is Leo ♌ (The Lion) – a fixed sign with Fire as Western element. The ruling planet is Sun – the center of our universe. According to the ancient art of Chinese astrology (or Eastern zodiac), Rabbit is the mythical animal and Fire is the Eastern element of a person born on August 20, 1987. What is the birthstone for August 20? Fun fact: The birth flower for 20th August 1987 is Poppy for preparedness. What is a good birthday trivia for August 20? How many babies were born on August 20, 1987? Base on the data published by the United Nations Population Division, an estimated 138,691,278 babies were born throughout the world in the year 1987. The estimated number of babies born on 20th August 1987 is 379,976. That’s equivalent to 264 babies every minute. Try to imagine if all of them are crying at the same time. What is the popular baby name on 20 Aug 1987? What’s your bizarre Florida Man story? The #FloridaManChallenge is breaking the Internet and social media. Some crazy men, women, or creatures from the Sunshine State are making headlines every day of the year including your birthday. Try this fun exercise. Pick your search engine of choice and type in “florida man August 20” and see what kind of wild news headline you will get. This viral craze started in 2013 and gets resurrected now and then. The latest was from Tumblr and found its way to Twitter. As they say, the rest is history. Here’s a quick list of all the fun birthday facts about August 20, 1987. Celebrities, famous birthdays, historical events, and past life were excluded. Try another birth date of someone you know or try the birthday of these celebrities: January 15, 1990 – Sophie Sumner, English model and actress; January 31, 1987 – Marcus Mumford, American-English singer-songwriter; March 4, 1953 – Rose Laurens, French singer-songwriter.